Edel Assanti is pleased to present Second Nature, Oren Pinhassi’s first UK solo exhibition. Second Nature invites us into an environment that is at once familiar and foreign, in which traditional categories of architecture, nature and body are collapsed. These classical divisions, along with ensuing binary delineations of structure, space, gender and sexuality, are rejected by Pinhassi as delinquent features of a postmodern era in its twilight. Pinhassi’s installation conjures abstracted renditions of gay cruising spots, from bathhouses to parks. The sculptures harness the sexual charge of these communal spaces, where concealed desires are rendered visible. Freestanding pavilions recall urban structures, offering limited shelter or privacy, yet inviting voyeuristic curiosity in equal measure. The pavilions’ glass walls have been rendered opaque by the artist’s application of Vaseline in repetitive, painterly gestures. The spectre of modernism is inescapable – the plaster used in the making of the sculptures evokes poured concrete; each object is unique, yet their formal and geometric regularity is decidedly functional. This sensibility is undermined, however, by the fantastical, corporal allure of these objects. Reclining chairs are personified, mimicking limbs and body language in their configuration. Serpentine towels are curled up on the floor – twisted and used, yet hardened by the solidified plaster with which they have been filled. Where bodily forms at first seem absent, the body’s presence is implied by the scale or practical use of the structures. Smaller pergolas evoke tropical vegetation in their green colour and seemingly organic form, yet their rigidity suggests they too have some non-prescriptive purpose. Two glasses are attached to each of these umbrella-like trees, one at hand held height and the other at genital height. 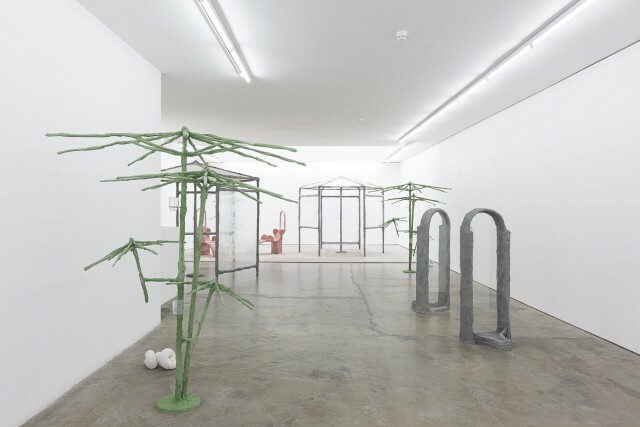 Orifices are present throughout the exhibition, overtly gaping from a pink burlap coated in plaster hanging from a towel rack. Whilst the exhibition is populated by sculptures, it is the relationship between physical environment, behaviour and psychology that is the primary subject of Pinhassi’s enquiry. His alchemical sculptural process transposes a handmade peculiarity to each object, idiosyncratic in colour, texture and form. The concrete geometry of urban public space melts away – yet if this is nature, it is a new dawn. Oren Pinhassi graduated the Yale School of Art in 2014. Recent solo shows include One in the mouth and one in the heart at Skibum MacArthur, Los Angeles, 2018; Springs at the Petach Tikva Museum of Art, Israel, 2017; Nature Calls at RIBOT Gallery, Milan, 2017; Hanging Gardens at New Capital Projects, Chicago, 2016. This summer Pinhassi will be included in This Is Not A Prop at David Zwirner, New York; in 2019 he will be included in a group exhibition at Contemporary Art Museum Houston. Completed residencies include Outset Contemporary Art Fund’s Bialik Residency, 2017, the Shandanken Project at Storm King Sculpture Park, New York, 2016 and the Skowhegan School of Painting and Sculpture, Maine, 2014. Pinhassi has been awarded numerous prizes including Fannie B. Pardee Prize, Yale School of Art, 2014; The Art Slant Prize, 2014; Shlomo Witkin Prize, 2011 and the Excellence Program Scholarship, Israeli Ministry of Education, 2011. Pinhassi lives and works in New York City.